Nothing could be more alarming than experiencing a dental emergency, especially with it’s Saturday evening. Do you think your emergency can wait until Monday morning? Probably not, which is why reaching and seeing an emergency dentist who offers weekend hours, especially during the evening, is so important. However, these types of emergency dentists can be tricky to track down, especially those who offer any hours on Sundays whatsoever. Thankfully, you’ve found us! Searching for a dentist open on Saturday is no easy feat. Though they are around, most of them require appointments. Trying to book an appointment over the phone when you have an unbearable toothache isn’t exactly easily done, however. Because of this, we’ve helped our patients book an appointment with an emergency dentist open on Saturdays while they prepare for said appointment instead of booking it themselves! What Do Weekend Dentists Do? Weekend dentists offer their services to patients who require them on the weekend, typically when their usual dentist are not open for business. It can be hard to get time off work, away from your children, etc., in order to see your regular dentist during the week. Because of these reasons, weekend dentists have popped up across the country. Some weekend dentists offer services during the week, but the majority of these dentists tend to hold all their office hours during the weekend. There are dental offices that operate during the week who offer weekend hours, such as being open on one day during the weekend for a couple of hours, but this is usually pretty rare and they are often fully booked before you get the chance to call and try to book an appointment for yourself. 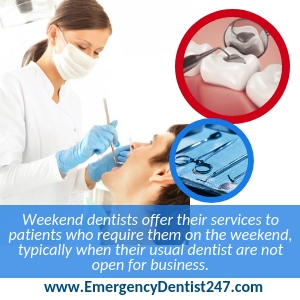 The problem we’ve most often found with patients who are looking for help from an emergency dentist, is that it can be hard to find one who operates during the weekend. Waiting for regular office hours isn’t possible with blinding oral pain, which is why we’re here to offer our help. How Do I Find a Weekend Dentist Near Me? The problem with using search engines, such as Google and Yahoo, can be great tools for finding a dentist near you, whether they work on weekends or not. However, using these tools can also be very problematic. Based on using a search engine, you will only receive dental offices closest to you, but not their exact business hours. This means that, even if you find the closest dental office to your home, they may not even be open at the time. Because of this, we’ve crafted a 24-hour dentist referral network that consists of regular dentists who operate during the week, emergency dentists with various office hours throughout the week, and both regular and emergency dentists who operate during the weekends and on holidays. Our free service helps patients by taking the search for an emergency dentist, or regular dentist, who operates during the weekend into our own hands. We use our extensive network of dentists to book an appointment for patients in their name. All you have to do is call us at our toll-free number, (855)-352-6790, give us your details, and we’ll get back to you with an appointment in as little as 24 hours. We’ve helped patients who have nowhere else to turn for help, which includes patients who do not have dental insurance. Sundays are the worst possible day to have a dental emergency, or require a dentist, in general. 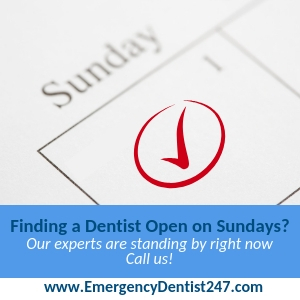 It can be extremely frustrating to try and find a dentist open during weekend hours, but Sundays seem to be the one day where no one is open or they are already fully booked. Don’t wait for the pain or the situation to get worse – you may not be able to hold out until Monday for regular office hours. Even when the week starts, you may still have to wait for a couple of days to secure an appointment for yourself. Our experts are standing by right now, waiting to take your call and help you find a dentist open on weekends to care for whatever dental problem you are currently facing. Call us now!